The Blackmagic Design Cinema Camera features a 2.5K image sensor, 13 stops of dynamic range, and a Micro Four Thirds lens mount. It is capable of recording 12-bit CinemaDNG RAW files at full 2.5K (2432 x 1366) resolution, as well as 10-bit Apple ProRes and Avid DNxHD formats at 1080p. The camera records to removable 2.5" SSDs, which enable the high data rates required for RAW and ProRes HQ recording. The camera is housed in an elegant, minimalist enclosure, crafted from a single block of aluminum. The passive Micro Four Thirds (MFT) lens mount offers compatibility with a wide range of manually operated lenses, while also being easily adapted to other mounts such using optional third party adapters. Footage is monitored and settings are adjusted using the large 5" rear LCD touchscreen. The touchsreen also lets you easily add metadata to your shots, such as shot number, filenames, and keywords, which can save time and money in the post-production process. PLEASE NOTE: The camera cannot format SSD drives. SSD drives have to be formatted (via an external 2.5" compatible dock) as HFS+ or exFAT on a Mac or Windows PC. Captures a super wide dynamic range of 13 stops into 12-bit DNG files for a true "filmic" look, offering more flexibility in your shooting locations. Also it preserves detail in both shadows and highlights, and even handles indoor shots while keeping the details of any images captured through windows, and allows for keeping all sensor data and enhancing the creative decisions during DaVinci Resolve color grading. The passive Micro Four Thirds (MFT) mount gives you compatibility with a wide range of manually operated lenses, while also being easily adapted to other mounts via optional third party adapters. With the Blackmagic Cinema MFT Mount Camera you are not locked into any specific lens and you can choose the lens you need based on the creative style of your shot. The five-inch touchscreen allows for setting up a shot, as well as playback from the SSD using the transport control buttons below the screen. You can enter shot data and update the camera's settings using the capacitive touchscreen display. Also control the camera's operating functions with a simple touch of the screen, just double tap to zoom the image for fast and accurate focus. Additionally a data strip provides you valuable information including record status, shutter angle, ISO, battery level, record time and more. The Blackmagic also features built-in metadata entry so that files include information compatible with popular editing software. This dramatically speeds up the whole post production process, and can save a production valuable time and money. Entering metadata is easy - simply tap the capacitive LCD touchscreen to display the slate where information can be entered including shot number, search tags, scene number, Timecode, and more. You can set shot number and other data to increment automatically, allowing for quicker setups while shooting. And the Metadata is compatible with leading editing software and is fully searchable, bypassing the time consuming task of searching for specific shots when editing a project. A Built-in SSD recorder uses low cost 2.5" SSDs and allows for 2.5K uncompressed CinemaDNG RAW 12-bit capture, as well as Apple ProRes and Avid DNxHD compressed video formats. 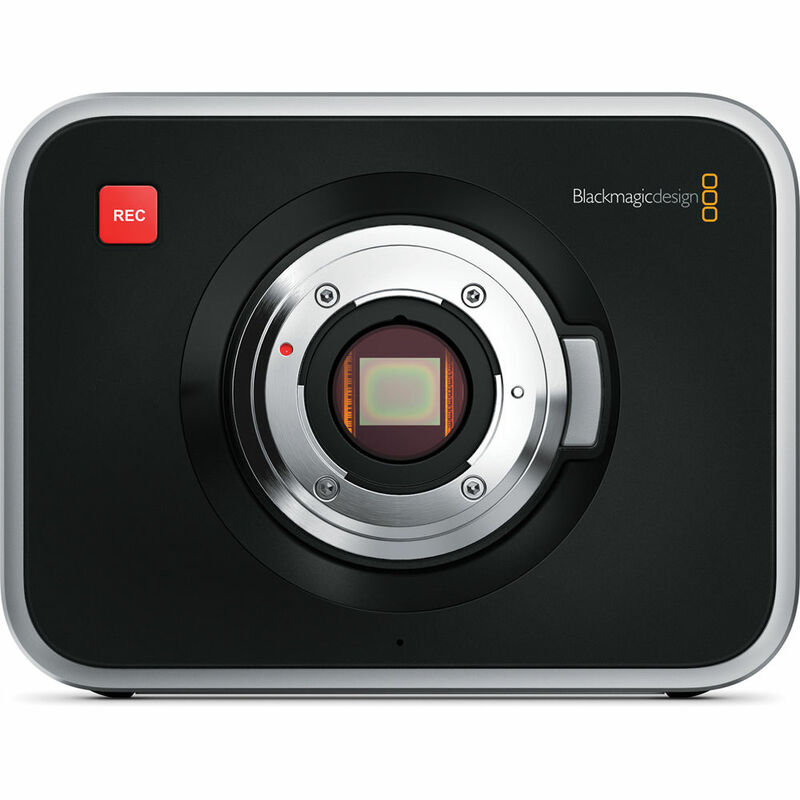 You can play back directly from the camera, mount the disk to any computer, or use Blackmagic Design's HyperDeck Studio deck. Also with Apple ProRes and Avid DNxHD video formats, you can record for more than five hours on a single 480 GB SSD, allowing you to shoot longer and give yourself more footage to play with in the editing process. All file formats conform to open standards used by most professional NLE software, allowing for seamless integration into most post workflows. When finished shooting, simply connect the SSD to a computer and edit or color shots straight from the disc. The Blackmagic Camera also comes with Full DaVinci Resolve software including Resolve USB dongle for Mac and Windows. You can shoot wide dynamic range images and then make color correction decisions in post production with this industry standard software. Additionally, Media Express software for video capture from the camera's Thunderbolt port is provided, and UltraScope provides technically accurate waveform monitoring. You can also connect the camera to any computer using Thunderbolt to display six live scope views on a single monitor. Box Dimensions (LxWxH) 13.2 x 8.9 x 7.0"
Cinema Camera (MFT Mount) is rated 4.4 out of 5 by 23. Rated 4 out of 5 by Danny from PROS & CONS Image quality really is amazing, especially the RAW. There's a creamyness to the look that is very pleasing, and that I find hard to find on other similarly priced video cameras. For instance, even the much higher priced Canon C300 has a harsher, more video-ish look to my eyes. Still trying to find a way to work with the rather cumbersome ergonimics...haven't given up yet! And sound...still trying to get that working in a way that doesn't feel like way too much work. But the image is gorgeous and beautiful and pleasing. I think I can notice a little bit of jello when camera moves too much. Seems a bit sensitive to it on that end. Rated 5 out of 5 by Phoenix from Forget all the Gripes The BreakDown 1. Dont be afraid the crop is not as bad as they say. Used canon 17-40 worked fine. 2. The image is insane forget that Mark III Raw hype. 3. Who needs Raw when the Prores Dynamic Range is all you need. Its just as good as the c500 range. I blew highights out on purpose and brought them back easily with Resolve. 4. They complained about the low light but honestly its perfectly fine with the dynamic range its like shooting 3200iso on MarkIII 5. Yes it has a fan and it helps keep this baby from overheating. 6. Everyone complaine about the LCD but I was out in the Texas sun & it worked fine and if you expose with your meter like your supposed to then just hit record the dynamic rabge will cover you in post. 7. The Rolling shutter is not great but nothing you cant fix in post. Just use a rig. 8. Get a battery pack 9. The depth of filed is perfect yes its so much like film even at 5.6 and 8 the DOF is just right dont listen to the gripes. 10. Prores 10bit is all you need FYI the Samsung 840 Pro's work great for Raw and Prores no dropped frames. Rated 4 out of 5 by Kit Staysweet from Interesting Camera Beautiful latitude. Comparable to the Alexa. Use it as an additional camera on network television shows. Rolling shutter is an issue. External power supply is a must. MFT allows you to mount to almost anything. I use a set of zeiss superspeeds with mine and the wooden camera pl adapter. I would suggest getting a monitor with histogram or meter. Also be sure to test the camera thoroughly. The first camera I received had a defective sensor. Once you get this camera rigged. It's a ton of fun. Rolling shutter is my biggest complaint. Rated 4 out of 5 by Kit Staysweet from Great camera with issues I bought this camera for the dynamic range. Which makes it an amazing camera for the price, especially the newly reduced price. I use it with a PL adapter and Zeiss Superspeeds. Things you should be aware of. Rolling shutter is an issue, the ergonomics are awkward, you need an external power source and most importantly the camera has totally inconsistent quality in it's sensor manufacturing. Some batches of sensors have horrible banding issues in the shadow detail. This is an issue that only exists in ISO's other than 200. Be sure to test your camera with the lens cap on while it's still under warranty. If you get a good one great but don't get stuck with a bad version of the camera. It's a flagship model. It has issues. Rated 4 out of 5 by Picture Planet from Great camera I picked up this camera to shoot short films and smaller scale commercial work. It is incredibly intuitive to use I find that the menus make a lot more sense then other cameras I have used (7D, HVX, Scarlet). Everything is where I would expect and I love that I can flag clips in camera. Also, RAW, Pro res and DNXhd are all logical formats to shoot in. Footage looks great. Additionally, the camera is built very solid. It feels like a tool in your hands- not a toy. Great buy. Rated 5 out of 5 by DLN from Great Camera I like this camera. I like this camera a great deal. Before I bought it I did a lot of research and I was aware of what everyone thought were the flaws. First as several people have pointed out this is a modular camera even though it's priced below several DSLR's and for this camera to reach its potential you will need to add things like a external battery, a rail system and a after-market hood for starters. A cage of some sort is also important but B&H sent a Bescor cage with the camera which was a welcome freebee. There is one add-on that is critical in my opinion; the Metabones Speedbooster in MFT mount. The Speedbooster makes the BMCC a very different camera. It changes the crop factor to 1.53 and adds a 1.3 stops to your lens. So now the high crop factor, which was my main objection about the camera, is gone! You should just consider this as part of the camera and order it at the same time you order the BMCC. It also allowed me to use all the Nikkor glass I have accumulated over 40 years and that was a huge savings. One of the things I like best about this camera is its simplicity. The camera doesn't have layer upon layer of menus to sort through. Those of us that started shooting with Arri BL's and Bolex's will find the BMCC more like these film cameras. That is a plus for me. I don't know if I would consider this camera a run and gun camera. I have a Panasonic HPX 250 and after all the modular stuff is on the BMCC it is actually a bit larger and heavier than the 250 but I bought the BMCC for the 2.5K and 13 stops of Dynamic range not for a run and gun camera. It can be rigged for run and gun but this is really a production camera, I think. Shooting in bright sun will be a problem unless you have an external hood and even then it can be a problem seeing the screen. In all fairness bright sun renders any viewfinder screen all but useless. My 250 needs some sort of hood for the flip out screen as well. I solved this issue on the BMCC with a Hoodman HBM1. But even with the Hoodman in really bright, direct sun at my back I had to add a cloth hood like I used on the old 4X5 film cameras. I made this hoodie into a tube and added Velcro to hold it on the camera's hood. It's a bit awkward but allows me to do critical focus and clearly see the screen. A lot of criticism has been directed at the audio of this camera. If you plan on using the onboard mike and audio I wouldn't get this camera but does anybody use onboard mikes and audio for serious work? I use wireless with the camera and the 250 also. I don't really understand the audio issues people have with this camera because wireless systems make the issues they mention mute points. This is a modular production camera. Also plan on color grading all the video in post. If 2.5K isn't important and you don't plan on doing a lot of post production or don't want to do a lot of post production then there maybe better cameras for you. However the camera does come with Divince Resolve, which is another whole story. So to get the most from this camera you'll need to treat it like the modular camera it is and for sure add the Speedbooster. For the small production house or the large production house for that matter this is a great camera. It allows a level of production that my HPX 250 (as great as that camera is) does not allow. I highly recommend this camera. Rated 4 out of 5 by Jason from Camera with great specs, but spotty QC Blackmagic wanted to hit an out-of-the-park homer, but managed a good solid double. Price and professional specs are the huge pluses of this camera, though many, myself included have had a wide variety of problems. I personally had the banding noise in low-exposure images and the camera would turn on by itself (although predictable and thus, avoidable). My camera is currently back at Blackmagic getting fixed. But having worked with the camera for 2 weeks before it went back, the images are stunning and the MFT mount is extremely versatile. I paired it with some vintage Zeiss primes (zebras) and was thrilled with the image. If you're a patient person, jump on the wagon and deal with the work-arounds. Otherwise wait a little more, but keep your eye on Blackmagic, they are a huge player in this market. Rated 5 out of 5 by Jim from Excellent Camera Everyone is so focused on the low light limitations of this camera. Here is my modest and realistic story and experience with this camera. NOTE: this review is for indoor shooting with no outside light access. I shoot indoors with this camera at 200 ISO !!! 400 and 800 will obviously produce some noise. I'm not a fan of that so I keep the camera at 200 ISO. For this you'll need a modest light set up. I enjoy the look of tungsten 3200 k. I set up 4 Mole Richardson mini moles, a total of 600 watts of lighting in most cases. I have found that this is perfectly sufficient to get enough light into this sensor to achieve and incredible image. I always shoot with this camera at 2.5 K. They are very manageable file sizes. When I'm in a hurry, I add rec709 to the grade and most of the time it looks lovely with no additional grading. NOTE: I am not a fan of everything having to be well lit in a scene. I like contrast. And when I shoot with this camera at 200 ISO, I love the fact that the dark areas have no noise. I've been shooting with the EF version of this camera for several years. I am switching to the micro 4/3 mount because of a review I watched from Philip Bloom about this micro 4/3 mount for this camera. He reviewed it with some Voigtlander .95 glass and I was blown away. Keep in mind this camera does not have an active mount so only manual lenses will work. That's a bonus as far as I'm concerned. Now about the audio path. Everyone is complaining about plugging shotgun mics directly into cameras, whether it be dslr or these budget cameras. Invest in a mic pre !!!!! It's your only solution !!!!! I immediately became a huge fan of the sensor on this camera because of the film like quality and the affordable price point. Thus I bailed on any further use of dslr shooting. This camera is The excellent choice for producing incredible results when you cannot afford a $12,000 plus camera.